We've gotten to enjoy some fabulous projects so far with this fun partnership with Impression Obsession this week. This has been so much fun! I'm a big fan of cupcakes. Even though there is so much color going on in my project, I wanted to make sure that the cupcake is the star of the show. I chose to do this by bringing attention to the flower petals by making them sparkly, thereby drawing the eye to the center where the cupcake resides. Usually when I spray flowers with Spritz or paint flowers with Shimmerz or Blingz, I start out with white flowers and build color with the paints only. This time, the flowers were already colored at the outset. The flower in the background was a peachy-pink and the flower in the front was a light yellow-green. I built the color on the background flower by spraying it with a very light coating of Bed of Roses Spritz. I didn't want to change its color too much. With the yellow-green flower, I wanted more of the yellow color to be accented. I sprayed it three times with the Chick-a-dee Spritz, allowing time for it to dry between layers. 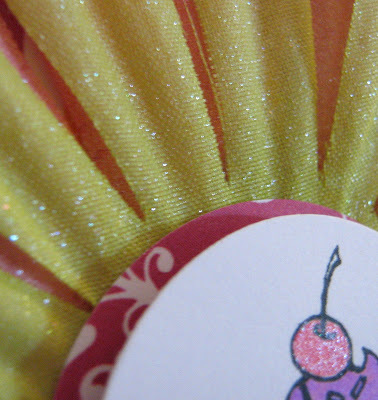 For a pretty dot of sparkle, I painted the cherry at the top of the cupcake with the Fire Engine Red Shimmerz. It's the perfect shade for a ripe summer cherry, wouldn't you say? I added the closeup photo to show just how sparkly the beautiful Spritz'd flowers are. It also highlights the pretty shine in the cherry. Thanks so much to the folks at Impression Obsession for sharing their terrific stamps with us! Stay tuned right here for more of the fun. Shimmer on! That cupcake stamp is so cute in the middle of the flower! Love it! How absolutely beautiful and such lovely colors too! Your flower is stunning and the whole card is just radiant. This is too cute! I love what you did to the flower!! Yum!!!! 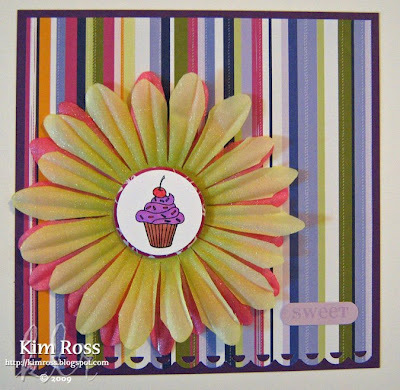 I love the layered flower with the cutest cupcake image!!!! Oooh, I love how you two-toned the flower...very clever!! Just beautiful.